The plight of Syrian refugees in Greece is reflected through their stories of how they arrived in the country, under what circumstances they were imprisoned, what they expected and what they eventually found. 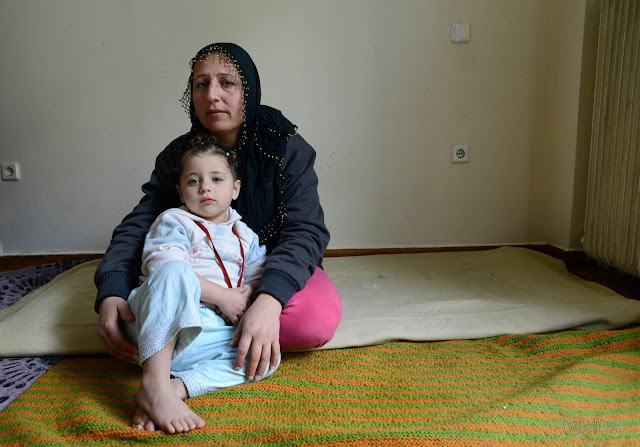 A 29-year old Syrian woman named Jihan with her youngest daughter of her six children, a 4-year old girl named Lilash, sitting in a small room that the whole family shares in Athens. 02 March 2013. 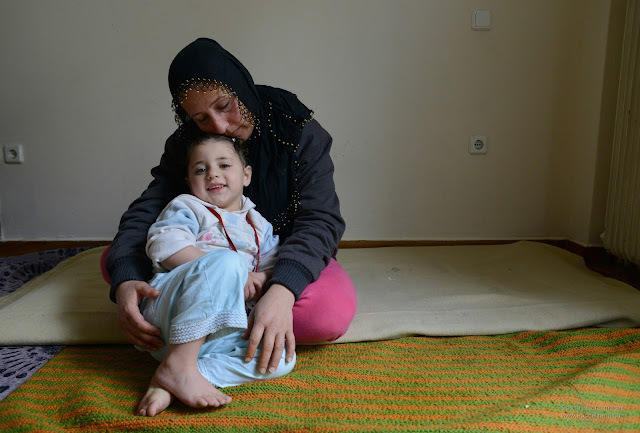 A 29-year old Syrian woman named Jihan with her youngest daughter of her six children, a 4-year old girl named Lilash, sitting in a small room that the whole family shares in Athens. 24 February 2013. 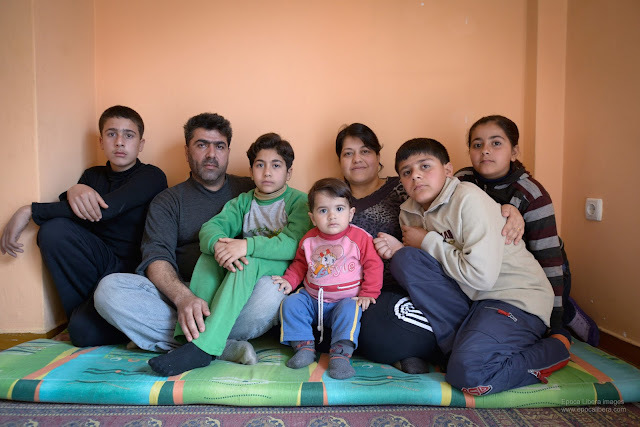 A 29-year old Syrian woman named Jihan with her six children, Elav (17), Assad (12), Vinda (13), Arash (9), Viann (7yo) and Lilash (4), sitting in a small room that the whole family shares in Athens. 02 March 2013. 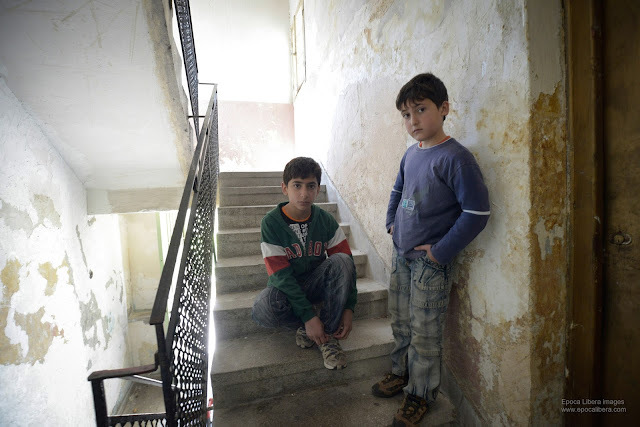 Mohammad (15) with his brother Gantzu (10), both sons of Aref, recently released from Chios refugee prison, sitting at the entrance of the flat that they were offered through the hospitality of other Syrians allowing them to live in Athens. 23 March 2013. 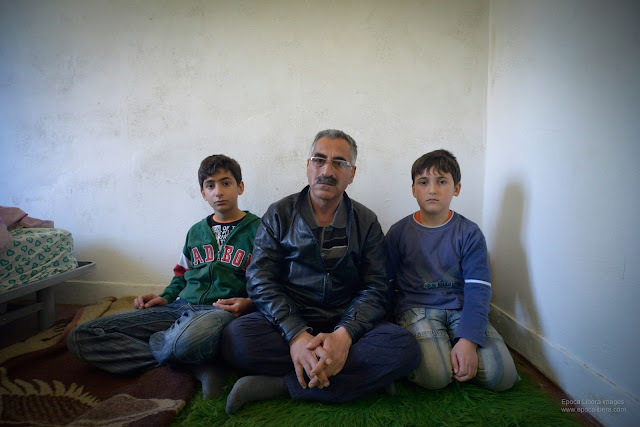 Aref with his two children Mohammad (15yo) and Gantzu (10yo), recently released from Chios refugee prison, sitting at the flat that they were offered through the hospitality of other Syrians allowing them to live in Athens. 23 March 2013. A Syrian refugee family recently released from Chios refugee prison, are now in Athens on the small room that they are offered hospitality by other Syrians. Edris (33yo) and his wife Rusan (33yo) who is pregnant on their sixth child, with their 5 kids. 25 March 2013. 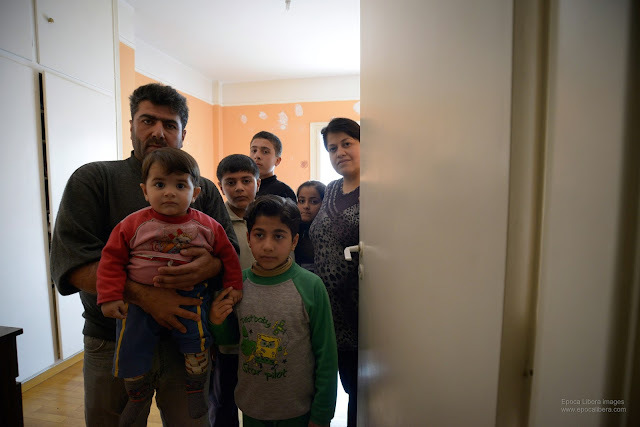 A Syrian refugee family sit in the single room that they were offered through the hospitality of other Syrians allowing them to live in Athens. 25 March 2013. Hachad Adib mourns his brother and their family, during a memorial service that is held in a makeshift basement mosque in Athens. They all died tragically when they drowned at sea in their effort to enter Greece to seek asylum. 26 March 2013. Hachad Adib bursts into tears when he receives condolences for the death of his brother and their family, all drowned at sea. 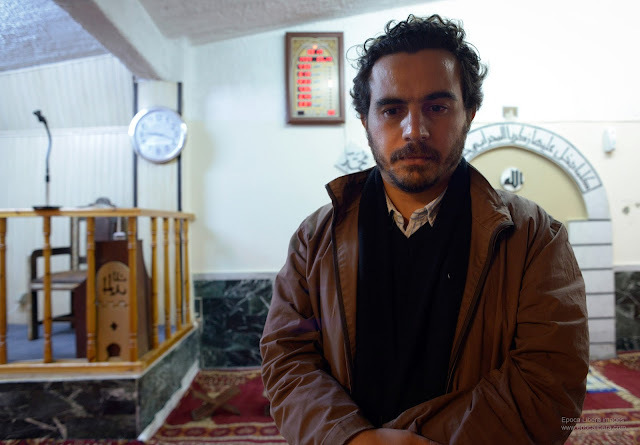 A memorial service was held for this reason in a makeshift basement mosque in Athens. 26 March 2013. 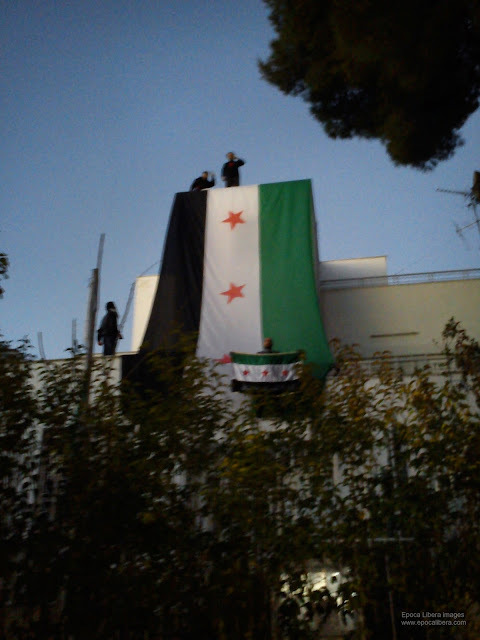 At dawn, a group of seven Syrian activists occupie the Syrian Embassy in Athens. The Embassy building is covered with a huge FSA flag. The squatters are all arrested and two of them are imprisoned. Athens, Greece, 25 December 2012. View of the audience during an event in solidarity to the Syrian uprising, that is organized in a squat in Athens, with aim to inform and attract the support of the Greek left. Athens, Greece, 12 January 2013. 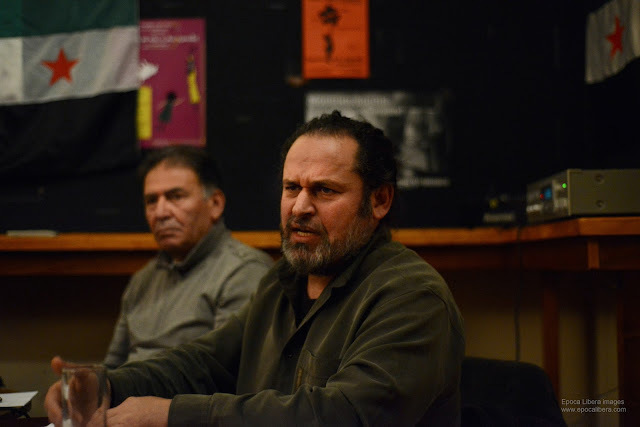 Former commissioner of the Palestinian Authority Ismat Sabri (L) and Syrian activist Kastro Preto Dakduk (R) speak during an event held in Athens in solidarity with the Syrian uprising. Athens, Greece, 12 January 2013. 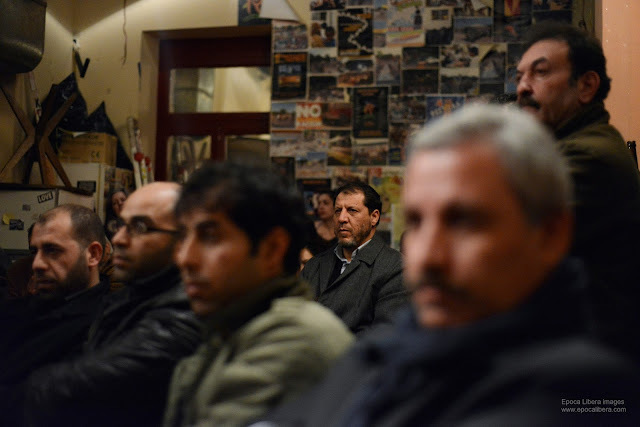 Syrian activists attend an event that was held in Athens to support the Syrian uprising. Athens, Greece, 12 January 2013. 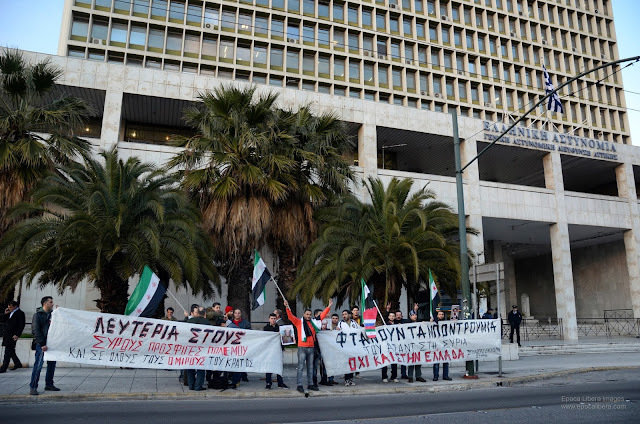 Syrians holding banners protest the imprisoning of Syrian refugees and asylum seekers in front of the Police Department building in Athens. The banner reads: 'Freedom to the Syrian war refugees'. 20 February 2013. 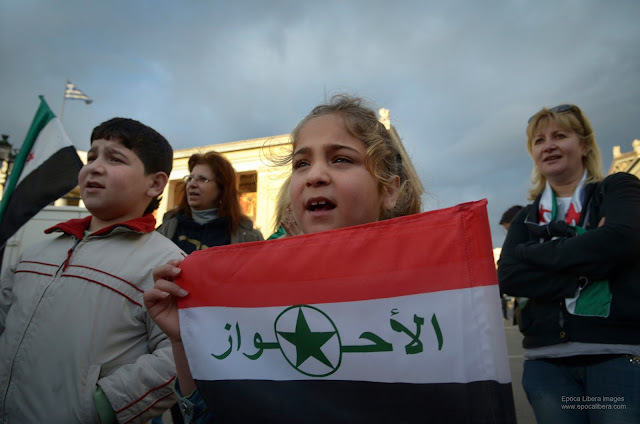 Viann holds a Syrian flag and chants slogans with her brother Arash on the 2nd anniversary of the Syrian uprising in Athens.16 March 2013. Viann holds a flag of the Free Syrian Army on the 2nd anniversary of Syrian uprising in Athens. Syrians organize a celebration. Slogan on the wall reads: "You are the refugees of Europe" and refers to the Greek people. 16 March 2013. A 29-year old Syrian woman named Jihan holding in her arms her youngest daughter of her six children, the 4-year old girl named Lilash, on the small room that the whole family share in Athens. 02 March 2013. Video: (English subtitles) A 29-year old Syrian woman named Jihan recounts the sufferings of her family in the small room they share in Athens. Video: (Ελληνικοί υπότιτλοι) Τα δεινά των Σύριων προσφύγων στην Ελλάδα αντικατοπτρίζονται μέσα από τις ιστορίες τους: Πώς έφτασαν στη χώρα, κάτω από ποιες συνθήκες φυλακίστηκαν, τι περίμεναν και τι βρήκαν τελικά. Thousands of Syrians have fled the war in their homeland and tried to find refuge in European Union countries. Many of them through the extremely dangerous path of the Aegean Sea, on plastic boats from Turkey to Greece. But even when they survive the deadly dangers of such a journey, it is almost impossible to be given asylum in Greece. Greek authorities can imprison asylum seekers for up to 18 months. 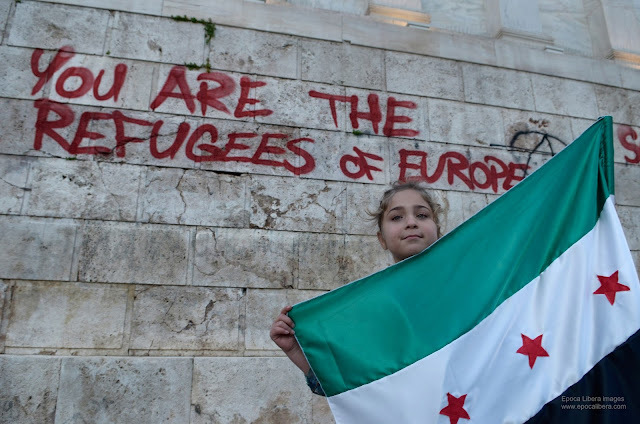 In 2012, no Syrians were granted asylum in Greece, as the European Commission reports. Most of the Syrian migrants plan to leave Greece for other European countries. The 29-year old woman named Jihan with her six children shares now a room on a flat in central Athens after having a troubled and dangerous journey into the sea and detention centers in the Greek islands. 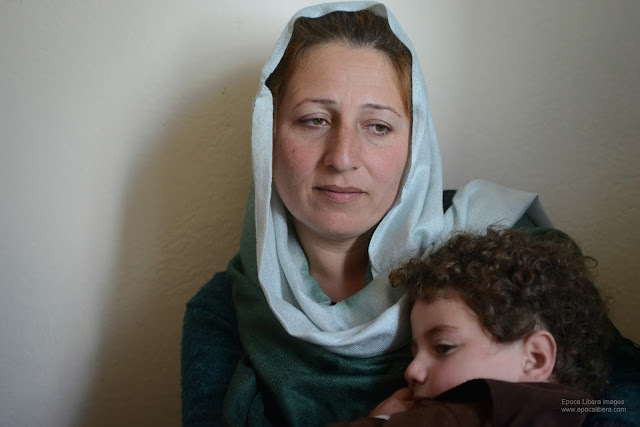 As she recounts on the video she lived very well with her ​​husband and her family in Qamishli, Syria. Her husband is a photojournalist and he was arrested and imprisoned while he was photographing the protests. When the explosions, the bombs in schools and the shooting into the crowd multiplied, the brother of Jihan’s husband urged her to take the children and flee illegally to Turkey. 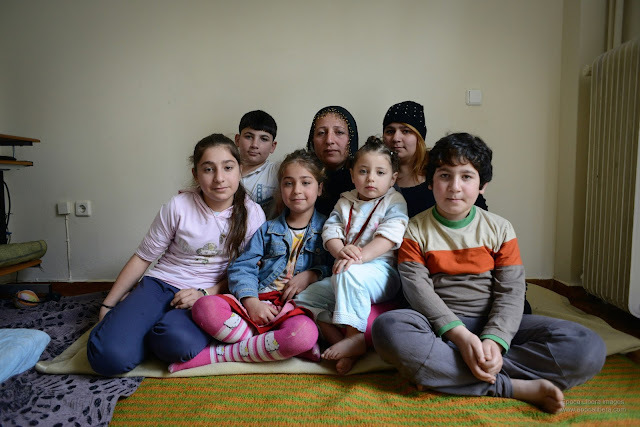 Along with her six children they crossed paths and mountains to arrive in Turkey. Smugglers in Turkey, forced her to board on a small inflatable boat with her children and others, a total of 30 people, to pass to Greece. The boat sank and were rescued by Greek coastguard vessel. They were moved to Agathonisi island where they were imprisoned straight away, while they were all wet from the sea. After some days they let them out and asked them to pay 7.5 Euros each, for a ticket to Samos island. They thought that they will be released, but eventually realized that they paid a ticket to go to Samos and being imprisoned again. Once again imprisoned in Samos, they were released to go by boat to Athens, to find themselves in the chaos of the capital, alone and helpless, facing a hostile and xenophobic society. 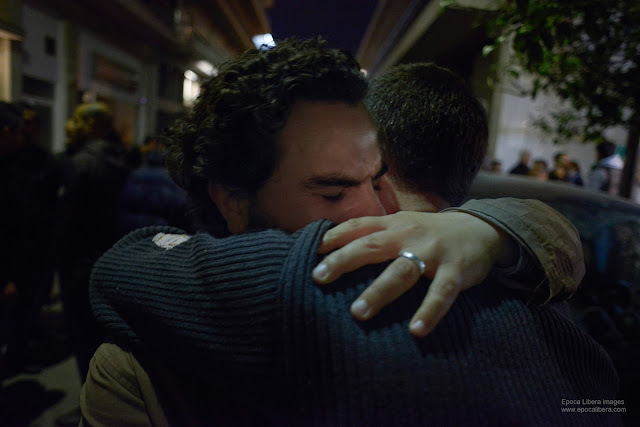 The 50-year old man named Aref with his two of his four children are now in Athens. They are hosted from other Syrians, changing home every week. They have not found yet a permanent residence. Aref used to have a shop with electrical appliances in Aleppo, for ten years. Seven months ago, he closed the shop because the area has turned into a battlefield, and fled with his wife and four children to a nearby village. The last seven months he could not approach either his home or his shop. He tried, but the army did not let him get close. He left the village with his two children for economic reasons to seek his fortune in Europe. In the village he did not have money even for milk for his kids. After the war has began, everything has become very expensive . There is neither electricity nor water. They came to Greece from the sea with a small inflatable boat that sank on the way. After being rescued by the Greek authorities they were imprisoned for one week in a small room in Chios island. “Unfortunately here we do not count as human beings” Aref says. “In Chios a woman was beaten by police officers in the detention center." 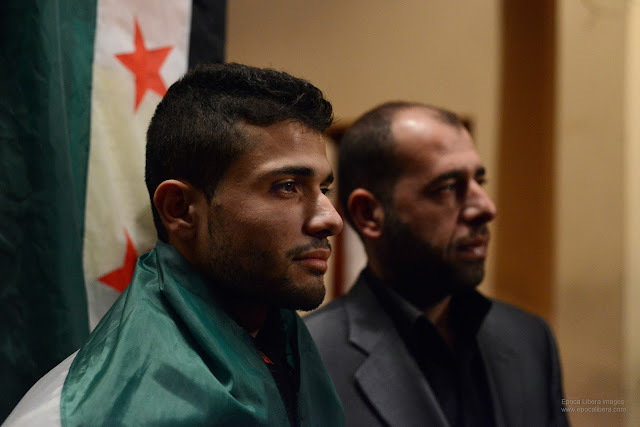 "We were pleased to be here in Europe, until we found out that here is the same with Syria. The only good thing they did to us was saving us from the sea." "They took all our personal property from the moment we stepped in Greece, the country of Plato and Socrates." Aref was detained along with his two children in Chios sharing a dirty little room with other thirty prisoners. On March 1st 2013, they were released to go by boat to Athens, where drama continues. The 33-year old man named Edris is watching a video on his mobile phone, with the remains of his houme in Allepo, that has turned into a battlefield between the FSA and Assad fighters. 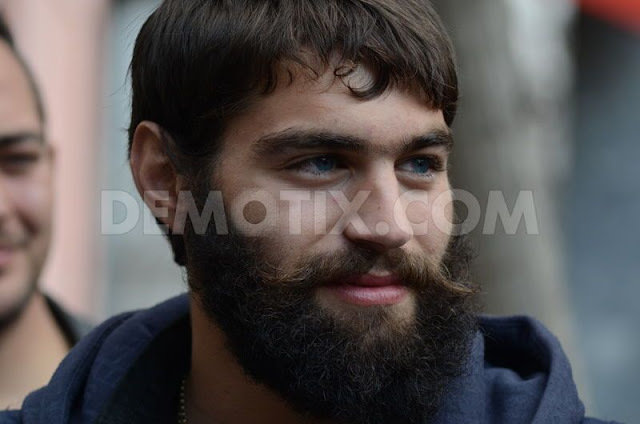 Edris is now in Athens with his wife named Rusan, who is pregnant on their sixth child, and their five children. They all share one single room on a flat with other Syrian people. Rusan was rescued from the sea by the Greek authorities while all the family was on a small plastic boat, together with other Syrian, trying to enter Greece from the sea in their effort to find asylum. They were detained for one week in Chios island, and then left to fend for themselves with vague prospects. Hachad Adib, came to Greece five years ago. On March 7th, 2013, at dawn, his brother, his wife and their three children, all died tragically when they drowned at sea in their effort to enter Greece to seek asylum. 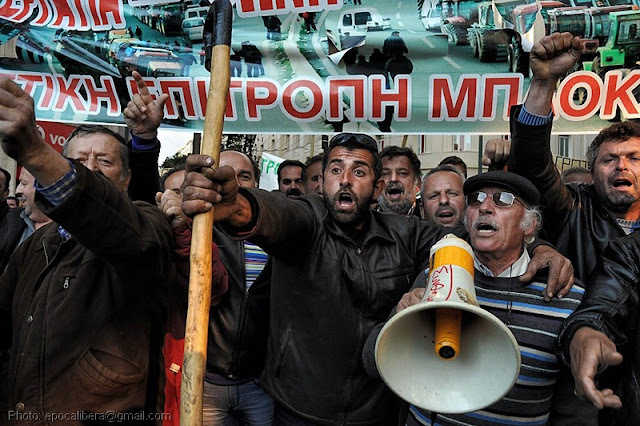 More than 4,000 farmers from all over Greece, gathered outside the Agriculture Ministry and marched towards the Greek Parliament demanding among other things, cheap oil, electricity and tax breaks, so that they can have competitive products. Farmers protest while chanting slogans in Syntagma Square. 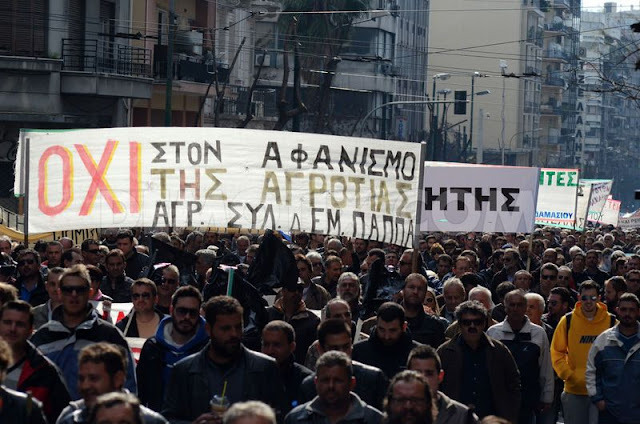 Thousands of farmers gathered in the Greek capital from various different regions throughout the country demanding amongst other things cheap oil, electricity and tax breaks. A farmer who has traveled from Crete island gathers to protest at Vathis square, outside the Agriculture Ministry. Crowds of farmers pictured in Vathis Square, outside the Agriculture Ministry. Thousands gathered in the Greek capital from various different regions throughout the country demanding amongst other things cheap oil, electricity and tax breaks. 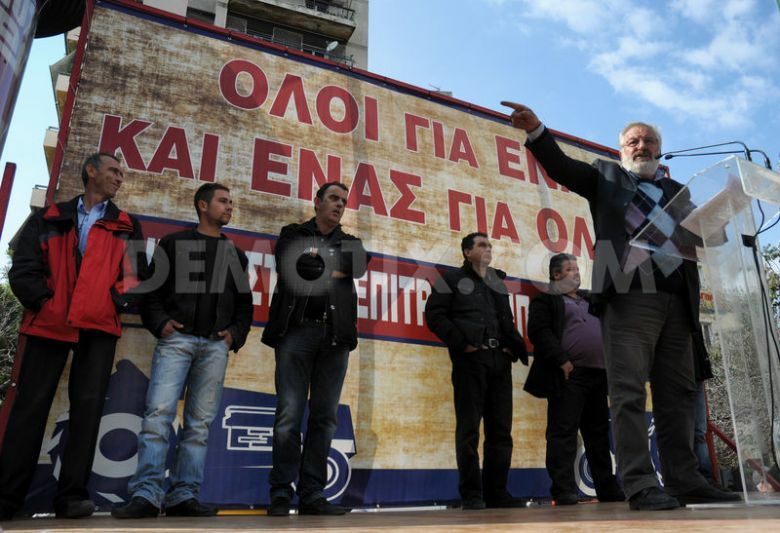 Vangelis Mpoutas, president of the Federation of Agricultural Associations of Karditsa, pictured while talking to protesters in Vathis Square. Thousands of farmers gathered in the capital demanding amongst other things cheap oil and electricity. A banner is held by farmers from Larisa during a protest at Vathis Square, that reads: 'Winegrowers die'. 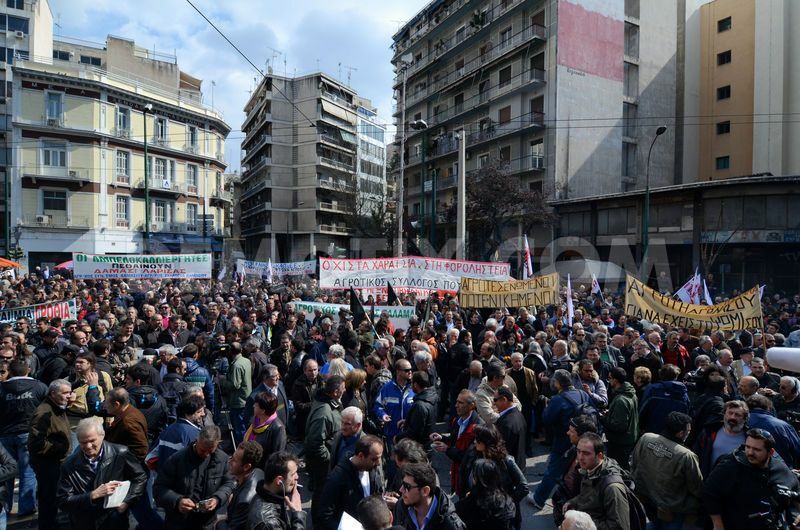 Thousands of farmers gathered in the Greek capital demanding amongst other things cheap oil, electricity and tax breaks. 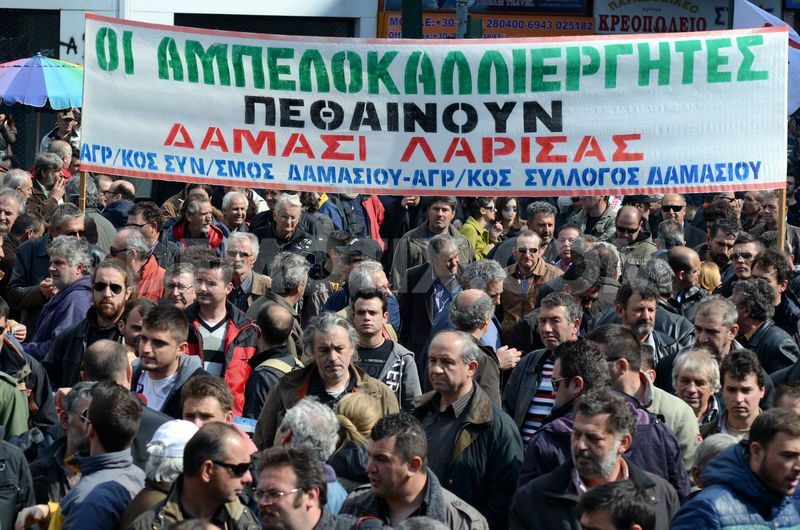 Farmers march in central Athens holding banner that reads: "No to the disappearance of the peasantry". Farmers march in central Athens holding a banner that reads: 'No to the wipe out of the peasantry'. 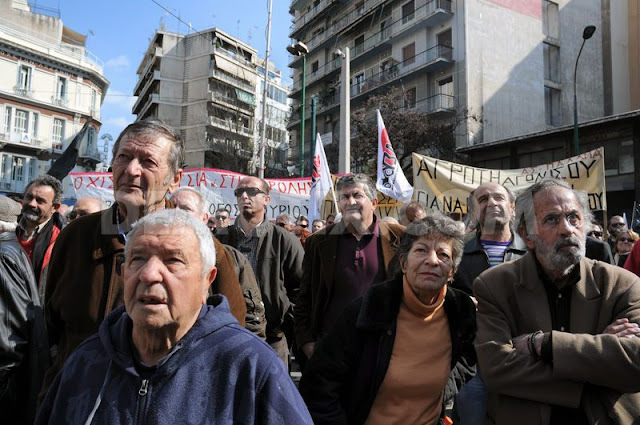 Thousands of farmers gathered in the Greek capital demanding amongst other things cheap oil, electricity and tax breaks. Leaders of Farmers Associations march in Syntagma Square chanting slogans. 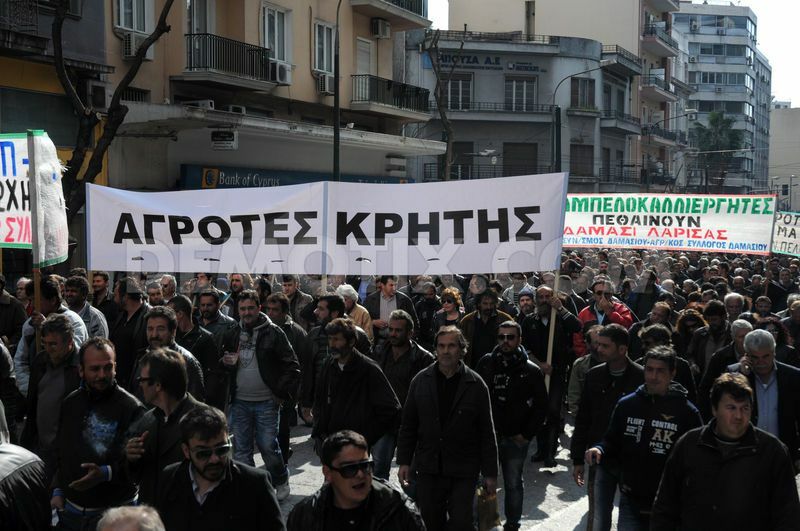 Thousands of farmers gathered in the Greek capital demanding amongst other things cheap oil, electricity and tax breaks. 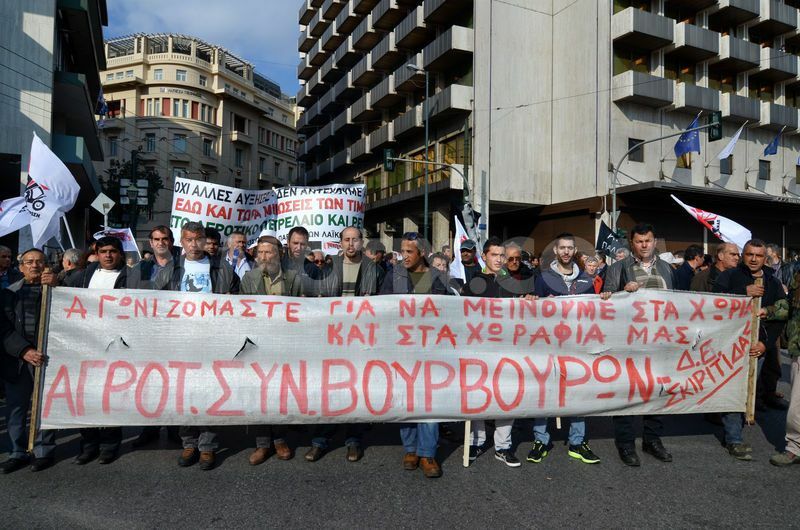 Farmers march in central Athens holding banner that reads: "We are struggling to stay in our villages and our land". Protesters while hearing the speeches during the gathering at Vathis Square. Panorama (180 degrees, 50 Mega Pixels) of the farmers protest gathering in Vathis Square outside outside the Agriculture Ministry. 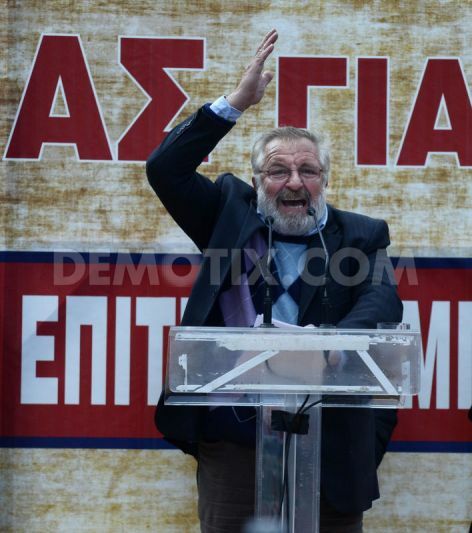 Aleka Papariga, General Secretary of KKE (Greek Communist Party) can be seen among the crowd. 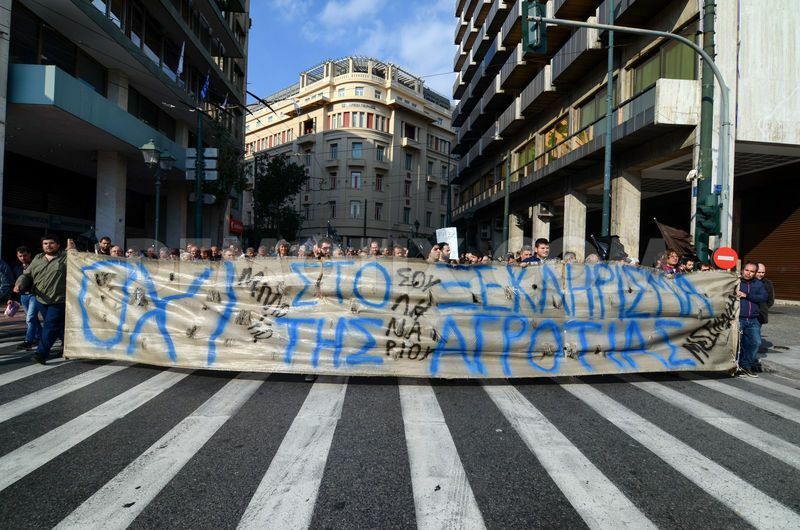 Farmers that have traveled from Crete island protest in central Athens. Video: Mr. Vasilis although his 70 years of age, came to Athens by bus to protest, with a group of farmers from Volos. After the rally ends before Parliament he is still standing there, and talks with the experience of a life in agriculture, describing the unresolved problems and the bad economic situation currently faced by the agricultural sector.